Black Cover Paper 125gsm A3 500 Sheets- XL Black is acid free- Ideal for craft and photography applications. Black Cover Paper 125gsm 640x900 250shts- XL Black is acid free- Ideal for craft and photography applications. XL Cover Paper A4 Red Pack of 100 sheets - 125 gsm acid free paper - vibrant colour - ideal for inkjet, laser and photocopier reproductions. 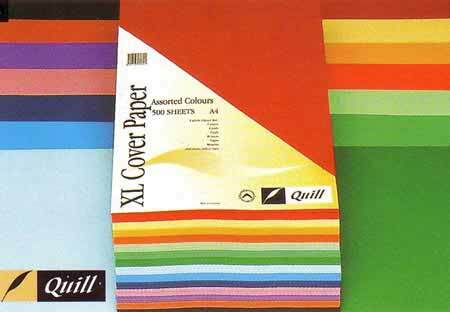 XL Cover Paper A3 Assorted Ream 125gsm Acid free - 14 vibrant colour assortment, ideal for most ink jet, laser & Photocopier reproduction. XL Cover Paper A4 Assorted Ream- 125gsm Acid free paper- 14 vibrant colour assortment- Ideal for most inkjet, laser and photocopier reproductions.